1. Preheat oven to 350°. Spray 13 x 9-inch glass or ceramic baking dish with nonstick cooking spray. 6 tablespoons butter and half and half over medium heat 10 to 12 minutes or until mixture has thickened, whisking frequently. Whisk in vanilla; cook 2 minutes longer. Cool caramel in saucepot 15 minutes. 3. Meanwhile, in medium microwave-safe bowl, heat remaining 3/4 cup butter in microwave oven on high 2-1/2 to 3 minutes or until melted; let cool slightly. 4. Place pretzels in large zip-top plastic bag; seal bag pressing out excess air. Cover bag with towel; with rolling pin or dull side of meat mallet, coarsely crush pretzels (pieces should be about 1/4-inch long). You should have about 3 cups. Add remaining 1/2 cup brown sugar and crushed pretzels to melted butter; stir with wooden spoon until combined. With hands, evenly press pretzel mixture firmly into bottom of prepared dish. 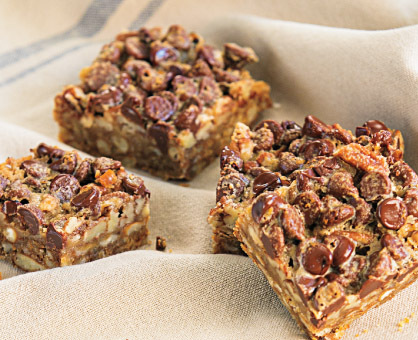 Evenly sprinkle chocolate chips and pecans over pretzel mixture; evenly pour caramel over top. 5. Bake 18 to 20 minutes or until top is golden brown. Cool in pan at least 2 hours before cutting into approximately 2-1/4-inch squares.